The brigand lumbered along the road between Staddle and Bree, shooting foul looks over his shoulder as he shrugged at the ropes that bound him. Little idiot, Eruviel smirked as she walked behind him, the end of the rope tucked into her pockets along with her hands. “I’ll pay you if you let me loose,” the young man attempted, slowing as he turned to look at her. “My boss is gonna kill you for turning me in,” the brigand spat. “Highly unlikely,” Eruviel responded, her eyes darting around as the air changed. “As soon as you tell me who he is I will personally take it upon myself to bring him to you so you can have that nice long chat behind bars.” Her captive did not respond, but she really didn’t care. Something was amiss. Urging him forward at a quicker pace she unclasped the strap from over her dagger. “What is it?’ asked the brigand, his eyes now darting around as well. If it is him . . . “For your sake, I hope it is nothing. Now move along. I will feel better with you safely in the prison.” Though that never stopped Arathier before. From the tension in the air she knew it had to be him. It had become familiar to her over the past weeks, and she hated that she looked for it while at the same time loathing it. And then it was there, like the heat of the sun blazing upon her back. “No further! You’ll hand him over to me!” Arathier growled as he paced around Eruviel and her captive like a wolf assessing its prey till he came to a stop, blocking her path into Bree. Eruviel jerked the rope back to her, the brigand crying out in surprise as he stumbled backwards. “I should have thought better of taking this road into town. You know I will not hand him over,” she replied sternly, narrowing her eyes. “Please, I do not wish to harm you in the process,” muttered Arathier, giving her a stern, cold look. Arathier studied her as he raised his dagger. “I can’t let him go,” he replied, his tone low from anger. Eruviel pulled on the rope again, giving the brigand a dark look when he resisted, looking between her and masked man with confusion. “Yes, you can,” Eruviel said, her voice thickening as her slight accent surfaced. “He dies today. It’s how it has to be.” Arathier moved a step closer . . . then another. Arathier smiled wickedly at something outside her vision. “It does now.” In a flash he threw his knife out. Seeing that the brigand had stepped from behind her, Eruviel reached out in attempt to grab the knife. It sliced across her palm as it escaped her grasp, burying itself into the brigands neck. Freezing for a moment, her hand burned from the pain as the young man fell to the ground, drowning in his own blood. Wrenching the knife from the brigand she cast the knife into the ground at Arathiers feet and turned away, pulling her wounded hand to herself. “Eruviel! Wait!” Arathier called out from behind her, following. Eruviel looked back at him with a wounded glare. “It is my turn to take care of the body this time, I believe,” she said quietly. “Eruviel you are bleeding,” he said, reaching out as concern filled his voice. “Look. I’m . . . I am sorry.” You don’t sound very sorry. Eruviel clenched her hand, dropping it to her side. “I am, but it is my own fault. I should have known . . . . No, it does not matter now.” Looking down at the corpse she stepped over it to get a better angle at picking up the deceased man. The coroner was only a short walk away. She could make it. Arathier gently took her by the shoulders, moving her back several steps. “Let me,” he said quietly. Picking up the body the walked off. “Wait for me,” he called as he hurried away. Turning her back to him she frowned down at her hand. The bleeding had slowed, but it would definitely scar. I won’t wait this time, she thought as she stood there. Music floated over the town walls and down the path and Eruviel sighed as she pulled a kerchief from her pocked and wound it over her hand. She hated that he could move her like that. She hated that he made her second-guess herself, and that she didn’t want to hate him in spite of their conflicts of interest. Arathier had lied to her about how many men he intended to kill. He killed too easily. Maybe that was what she hated most. Then he was back, standing in front of her. Carefully taking her hand he fixed her poor excuse of a bandage, securing the ends in a firm knot. “Thank you for waiting,” he said quietly. Glancing down at her feet Eruviel realized she had not moved. Looking up at him she merely nodded, still to frustrated to trust herself to speak. “Stop! You are under arrest for murder!” Glancing behind Arathier, Eruviel saw a man of the Watch standing several yards away, his crossbow aimed at them. “Put your bow down sir, please. There is no need for that,” she said calmly as she extended out her wounded hand. Could this Watcher be new? The Watcher aimed his bow at Eruviel as another emerged from behind the first, aiming his crossbow at Arathier. “I will shoot. He is a wanted criminal!” She did not recognize the second man either. Eruviel pursed her lips as she studied the Watchers, taking care not to acknowledge Arathier’s words. “Forgive me, Watcher. I did not mean to cause more trouble,” she said as she slowly stepped away. This is wrong, she thought as she observed the shifty, nervous movements of the Watchers. “Turn around,” ordered the first Watcher, motioning to Arathier. Arathier complied, putting his hands behind his head as he turned to face the Watchers, giving Eruviel a reassuring nod. Taking a step forward the second main leveled his aim. “Mr. Jack sends his regards,” the man spat. They aren’t Watchers! Both men fired their weapons. Arathier screamed out in pain as the bolts struck him, one in the chest, the other in the shoulder. Whipping her bow from her back Eruviel effortlessly pegged the first man in the forehead as he struggled to reload, and her second arrow sliced across the second man’s neck as he attempted to run. This is the difference between us, the why and how. Dropping to the ground beside Arathier Eruviel ripped the satin hem from her dress and pressed it against his wounds. “Don’t move, you will make it worse,” she hushed him, her voice catching. Arathier shook his head. “There could be more of them. Y-you have to leave me. I will be fine,” he choked. Quickly pulling his extra daggers from their hidden sheaths, Eruviel fit them into her belt and moved her quiver from her back to her waist. “You know I will not leave,” she said firmly, the color draining from her face. The blood had begun to pool around him and soaked in at her knees. If you were not wanted I could simply take you to the infirmary, she thought harshly. Eruviel shook her head defiantly as her eyes pierced through their surroundings. ” I cannot leave you like this.” Sitting up she whistled for her horse who grazed a short distance away. “The fourth,” she said a little too bitterly. “That is because it’s getting to be nighttime,” she quipped quietly, glad for the small smile it brought to his face. Meranor trotted up beside them, nickering unhappily at the sight and smell of blood. “I see them too,” she continued. “Keep talking, Arathier. You need to stay with me.” Eruviel kept her hand pressed firmly against his wounds as she helped him to his feet. “If you insist,” Arathier smirked, offering a garbled chuckle. Gritting his teeth against the pain as he settled into the saddle he did not protest when Eruviel tied him to the seat. “Khila amin, Meranor,” whispered Eruviel to her horse, scratching under the mare’s chin. Knocking an arrow on her bowstring, Eruviel tucked the excess length of her skirt into her belt and set out in a silent sprint, Meranor running in a smooth gallop behind her. The dark sentinels of old trees watched quietly as Eruviel led the way to the homesteads. Laughter from the guardhouse reassured her that they would not be spotted aside from Meranor, whom the Watch knew enough not to be concerned. Peace often caused the neglect of diligence, but tonight Eruviel did not mind. Reaching the house first, she quickly unlocked the door and opened it wide as Meranor came to a stop on the stoop. Arathier slid too easily from the saddle, his falling weight throwing Eruviel against the wooden door frame as she caught him. Wincing from the impact Eruviel drug Arathier inside, drops of blood marking the floor as she moved him to her bedroom and carefully laid him on the bed. “Talk to me Arathier. Stay awake,” Eruviel urged, lightly patting his cheeks before turning to rush through the house, gathering what supplies she could think of. Bringing a small cauldron of water with her she set it over the fireplace in her room. “Wha– what do you want to hear,” he muttered with labored breaths as his eyes followed her, his hands pressing down on where the arrows still protruded from his chest and shoulder. “Eruviel, I –” he started as she walked to stand beside the bed, unstopping one vial, then another. “Your hand!” he exclaimed weakly, remembering. “I hurt you,” he growled, grimacing as he tried to move the wrong shoulder. “I am sure it will not be the last time,” she said matter-of-factly as she lifted his head with her good hand. “Drink this,” she said, cutting off his protest as she forced him to swallow the clear, pale pink liquid. “Do it,” Arathier coughed gruffly, accepting the glove that she fit in his mouth. “Forgive me for this,” she muttered, her brow furrowing. Pressing one hand down on his chest, her other took hold of the first iron and wood bolt. The moonless sky seemed closer tonight, and Eruviel entertained the thought of reaching out and taking hold of the heavens that shone down upon her perch. Having enjoyed a much needed rest after having returned from Dale, the summer night called to her, and Eruviel gladly answered. She had missed her late night jaunts, though the evenings at home seemed strange after spending months on the road with Eirikr. I need to call on him, she thought grimly, praying that he had found some sort of rest. The night after their return from Dale Arathier had found her. She would have rather gone and found Cwendlwyn or Nillariel, but he would not leave her be till she allowed him to see to her injuries. However rudimentary it was, his care had helped, and strangely, so had his company. The summer air greeted her as an old friend, combing through her dark, loose hair as she padded barefoot atop the cool, narrow stones of a long forgotten wall. The weight of the past months had begun to lift from her shoulders in spite of the visions that still interrupted her sleep. Tossing the last pebble that she had gathered from the lake up to catch it, her mind wandered from Anyatka and Anric, to Forthogar, then to Threz. She still needed to find the latter. His letter sat folded in her pocket and she worried if the turmoil that had stirred up the populace had forced him into hiding. Keep your coin purse close, she thought with a chuckle as she cast the small stone over into the shadows in the valley on her right. “Ow!” sounded a voice from below. Startled, Eruviel peered over the side as she leaned over to better see the form of a man. “Oh! Forgive me! I did not see you there.” Where in Arda did he come from? Emerging from under the canopy of the trees Arathier stood, the glare on his face replaced with by a bright smile. “What are the odds, Eruviel!” he laughed as he rubbed a hand on the side of his head. “Be right there,” she called over her shoulder as she hurried down the final length of the wall. What is he doing here? she wondered as she jumped onto a stone platform. Jogging across it to where the grassy embankment replaced the wall, Eruviel slid down the fifteen feet to the valley belonging to the town of Archet. Walking over to meet him she noted that he was dressed in all black. “Hello m — er– Eruviel,” stuttered Arathier, his face going blank. “Buisness or pleasure?” she asked, doing her best to keep her voice even. Her eyes darted around in search for the piles of cut lumber she already knew would not be there. “I thought that was done with,” she said quietly, her hands dropping to hang loosely at her sides. “This is the last one,” said Arathier, his eyes falling to look at the ground. “No, it doesn’t,” she said firmly as she turned back to face him. 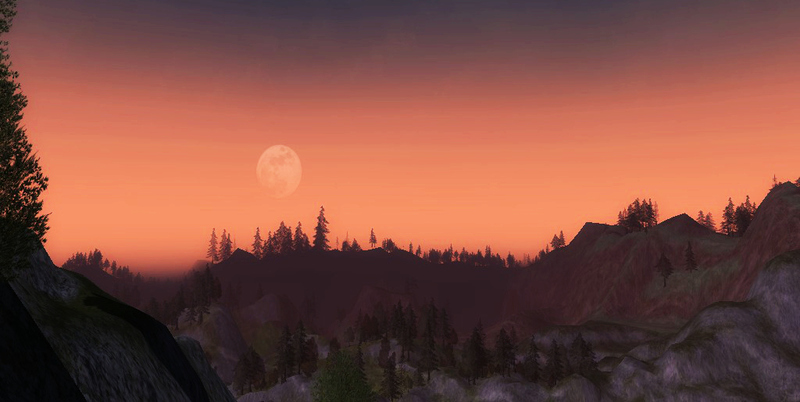 Standing on the top of the small rise Eruviel gazed into the West, her arms crossed over her chest. I should not wait, she thought. She could not be party to murder, no matter how justified it might seem. The bitter fool, she mused, searching the shimmering heavens over Bree-land. He did say this was the last one, she thought, as if trying to convince herself. Oh how she wanted to believe him. “Eru!” Arathier called out from behind her as she took her first step to leave. Halting, Eruviel turned to see Arathier stop several yards away and drop a hogtied body to the ground. “Maybe it doesn’t,” he grumbled. How badly did he beat you for you to look so defeated? she wondered as the brigand reluctantly stood, his shoulders hunched over. Eruviel shook her head at him as she cut the rope from around the criminal’s feet, using the long end as a leash as she casually motioned for the man to walk. “Then you owe me two drinks; the second some other time in town. . . without the mask,” she said with a grin as she walked away, swinging her end of the rope ever so slightly. “Dreadward!” boomed Adrovorn, his strong voice rising above the clamor of the fight taking place at an enemy stronghold a short distance away. Twenty well equipped riders fell into formation. Even their horses seemed to respond to the Gondorian Captain, waiting patiently for his next orders. Wheeling his black war steed around he stopped beside Eruviel, the two exchanging curt nods. “The same as usual, my lady,”Adrovorn responded, extending his arm down to tuck a stray strand of hair behind Eruviel’s pointed ear. His steel blue eyes lingered on her before flicking back to her quiver, counting. “It is not like you to worry,” Eruviel chuckled as she fit a new string onto her bow. “I don’t show it when I worry,” he quipped dryly. Sitting upright he patted the neck of his horse as he watched the fort beyond the treeline, waiting for the signal. “Until we reach Lindon I doubt that I shall sleep at all,” he added gruffly. Myrthrost, one of Adrovorn’s closest friends shot her an amused look over the head of his dwarven companion, Rhuniki, who blabbered on and on about how to best kill an orc. Wrinkling her nose back at him she turned her head just in time to see a torch being waved from the top of the wooden wall. “You will have time enough to sleep after we get to Thorin’s Hall,” said Eruviel, choosing an arrow from her back and knocking it. “No I won’t,” said Adrovorn quietly, laughing as color crept into Eruviel’s cheeks. “Myrthrost! Rhuniki! Take the gate,” he commanded as he unclasped and pulled out a black spiked flail from behind his saddle. Twenty swords rang as they were unsheathed in unison. The dwarf let out a zealous war cry, and he and the man dashed forward with Eruviel following a few paces behind, sniping archers from the wall. Shoving each other back and forth as they ran, Rhuniki brandished his axe, jesting with the more level-headed Myrthrost. Eruviel smirked as she released another volley upwards, giving the two precious seconds to get to the gate and take out the dozen orcs guarding it. Sometimes she wondered which one of them was the sidekick. It had been eight years since the Dreadward Tribunal had been formed. Campaigning across the North Downs into Evendim the troop fought with others of like-minds, dealing judgement and driving back the enemy where few dared to go. They had become a cohesive unit with Myrthrost, Adrovorn, Rhuniki, Milloth and Eruviel at its core. It had been a refreshing change from the years of living and fighting in the shadows of Angmar. Daran had been dissatisfied at her departure, but had also understood, even more than she had at the time. Sprinting through the gate Eruviel glanced back to see the column of dust rise from where the rest of the troops sped across the dry earth. What had it been . . . three years? Adrovorn had stopped her after a bloody battle and told her upfront of how he felt and of his intentions. He had been tactful in his own way, and eloquent as always, but the man never beat around the bush. And she had made him wait. “There they are!” shouted Rhuniki as a sizable number of Tarkrip stampeded down the lane towards them. Eruviel loosed a succession of arrows into the approaching mob as Myrthost fit a second rune between his fingers and cast barrier of protection around them. The sound of thundering hooves drew near, and as the Tarkrip stumbled over one another to retreat, the trip jumped to the side of the road to watch Adrovorn and his men thunder past. Taking a moment to watch the riders plow through the enemies ranks, their black cloaks billowing like smoke behind them, Eruviel split off from the man and dwarf to scale the lower inner wall of the fort. Running along the elevated walkway she dropped every enemy archer she laid eyes on. In the center of the fortified camp she could see Milloth battling the Tarkrip Commander. Adrovorn had dismounted and now fought back to back with the Eldar, leveling any foe that came within reach of his blood coated flail. They do not call him the Black Thorn for nothing, Eruviel smiled to herself as she plunged her sword through the skull of an orc clinging to the edge of the platform. Just as the battle seemed to have be won, a foul tension wound in her gut. Across the large yard Eruviel could see Milloth reach back to find his quiver empty as the Tarkrip Ccommander’s blade cut across his breastplate. A particularly large orc flanked Adrovorn as he was beset by two others, and at the same moment a dozen Tarkrip clamored up onto the wooden walkway on either side of her. In the blink of an eye she took note of the other fighters, and made eye contact with the few that had started to run towards her, their own bows rising. Knocking an arrow to her bowstring she took aim, the white fetching brushing across her cheek. My last one. She exhaled a whispered blessing to ignite the light oil, and released. The arrow streaked across the distance with a flash of lightening (courtesy of Myrthrost), and struck the enemy commander in the forehead with a sickening thwap. The foul creature had hardly begun to fall back when Milloth wrenched the arrow from it’s face and spun around to peg the orc leaping at Adrovorn in the heart. Drawing her sword and dagger Eruviel dodged the first two of her attackers before cutting them down. Thrusting her sword into another on her left she wrenched the weapon out to smash the pommel into the face of the orc behind her. An arrow from below took out the creature as it swung its dark blade, giving Eruviel the moment she needed to jump down from the wall, avoiding the spread of arrows that mowed down the Tarkrip defenders attacking her. Rolling as she hit the ground, Eruviel rose to her feet, and took a moment to observe Rhuniki finish off a downed foe before relaxing her grip on the hilts of her weapons. It was finally over. Nodding to the Rangers and Gondorian fighters that had come to her aid she walked across the yard littered with corpses towards the rest of her gathered comrades. The handful of men with her half followed, half guarded her. Adrovorn, she thought, letting out a short huff. Several months back his men had taken it upon themselves to ensure her safety, but this was ridiculous. The look Adrovorn shot her told her that even he thought his men might be taking their self-proclaimed duty too close to heart. One more stop, she told herself as she stepped between Milloth and Adrovorn, exchanging a smile of understanding with her brother. One more trip north to protect my future from the past. What is usually a Friday night with friends of Dungeons and Dragons has for the time been replaced by Westeros and A Song of Ice and Fire rp. I really enjoy the dice system and it’s a nice break from min-maxing a Fighter (Targeteer) Dread Pirate Half-elf. So, meet Marisily Thorne of Red Lake in The Reach during the age of The Dance of Dragons. It’s just a quick write up, but I figured that I’d share. It took Marisily a surprising amount of willpower to keep back an amused chuckle as she walked away from the campfire. She could hear the murmuring of jesting flowing back and forth between the men, directed mainly at the only one of the Briarguard who had plucked up enough courage to speak to her. They were good men, and she shared with them an equal concern for the welfare of the home they’d left behind. To the side of their encampment Kloe practiced her shooting with a skill that both surprised and instilled pride. Nodding to her sister as she passed Marisily could not help but smile at the sight of the mangled target. Marksmanship brought a connection with Kloe that Marisily had rarely shared with others. Usually she would have joined the young Thorne, but not tonight. Tonight she needed silence and time to gather her scattered thoughts. The closer she drew to her tent, the more her smile faded and a weight took hold within her. The news of The Blacks pressing north and Old Oak being surrounded renewed her sense of duty for her mission. But the rumors of dragons slaying thousands at a time made her feel sick. Slipping inside of her temporary shelter, Marisily clenched her fists, her eyes moving up the length of her bow. She was responsible for the lives of her men; for the life of her sister. She would do what she had to. What change did this bring to her husband’s vague instructions? “Nothing,” she said firmly. She would take the cards The Seven dealt her and use them to their greatest advantage. Sable. She had never doubted him, and she would not start now. Until he told her differently she would stand for neutrality, and work to keep the wolves out of the Lady Regent’s garden. Marisily’s hands steadied and the pounding of her heart quieted. Sitting down on the seat of her saddle, the Lady Thorne pulled out a piece of parchment and quill, and began to write. My sons . . . . Waving back to Nillariel, Eruviel walked across the common room of the Pony. She had enjoyed the hour chatting with her fellow Eldar about loneliness, life, and love, but a seed of worry had sprung inside of her as the minutes ticked by. He had not shown. Eruviel did not feel entirely surprised since he was still a wanted man, but Arathier’s failure to arrive made her wonder if something had happened. Bowing to the dwarf minstrel as she passed the front fireplace Eruviel’s progression up the steps was halted by the shadow of a man looming at the entrance to the passageway. So I was not imagining things yesterday, she thought grimly as she ascended the last few steps to pass by the Barding bearing a hollow expression. Lifting the hem of her long skirt to keep from tripping she swallowed her amusement. She wore the same dress he had practically remade for her back after Milloth had perished. “Good evening, mellon,” she said with a polite nod. Forthogar moved his eyes to Eruviel as she passed and nodded in the same apologetic fashion he had the night before. Yesterday, when she passed him on the stoop outside of The Prancing Pony he had refused to speak to her. He had disappeared with out a word for all those months and now would not even give her a “Well met?” Keeping a mask of calm and concern over her face Eruviel stopped a few paces past and turned back. “Not even a ‘hello’, or did you lose your tongue?” she asked in an attempt to sound light-hearted. Forthogar shifted his eyes towards her again as the corner of his mouth lifted up ever so slightly. He shook his head, softly before giving her that still-familiar wink. For a brief moment there was a slight glimmer to his foggy grey eyes, before they resumed their newly acquired emptiness. She could learn to bear the silence, but it was that void that troubled her. Inclining his head, Forthogar bowed with a low dip to her. The shadow of a smile hung on his lips for a moment longer. Giving him one final curtsey she swept down the hall and out the back door into the night. I couldn’t even look back, she thought grimly, the memory of his empty eyes burning in her mind. Shaking her head she forced Forth’s silence out, remembering that she had, in some way, been stood up. Meranor lingered in the overhang, untied from her hitching post, waiting patiently as she looked expectantly up at Eruviel. Unable to keep back a smile, Eruviel swung up into the saddle and let the mare walk forward on her own. Yes, Nilla, they are all scoundrels. “If I ever forget myself and travel too fast let me know,” Eruviel said matter-of-factly as they ran up the last incline. The day had begun to fade as she led Eirikr through a narrow ravine to a hidden camp site jutting out from a near cliff side. Eruviel smirked at Eirikr as they slowed to a walk. “Of course, though I doubt you would tell me you were not unless the moment was dire.” A twinge of gilt stung her as she glanced at the man. He had kept up with her all day, and it had been rather impressive. His shooting had gotten better throughout the day as well, but she knew better than to mention it. Her intent to encourage seemed to always get skewed somewhere between her speaking and the recipient hearing. No, it would be wiser to say nothing at all. Eruviel shrugged off her pack, chuckling as she began to rummage through it’s contents. “Now I see where Anyatka gets that look.” She remembered the look of the elf at their last stop who had given her a letter from Anyatka. The memory of the exhausted, addle-brained bird made her laugh a little harder. The poor creature. “You sent messages ahead there, as well?” asked Eirikr as he stretched his shoulder, kneading the muscle. Eruviel did her best to keep down a chuckle as she lowered herself to sit on the soft grass. “Merely that you seem exceptionally curious about a small matter that should be the least of your worries,” she said kindly. Eirikr stared down at her. “Eruviel, I plan on slipping in and slipping out. This is no pleasurable visit to Esgaroth, I assure you. I see our troubles greatest there as Ninim will be under guard. I hope to sneak Abbi out . . . unless . . . .” he trailed off and looked back out over the valley. Pulling out her water flask, Eruviel focused on uncorking the top. “I plan to ask the merchants we are to travel with. If we run into any Bardings on the road I hope to be as lovely and congenial,” and convincingly innocent, she thought, “as an Eldar lady can be to get whatever information they have out of them.” Taking a drink she arches a brow up to Eirikr. “You doubt me,” she said simply. Eruviel looked up at him with a faint smile before fixing her eyes on the emerging stars. “I did my research. Besides, I always bring my best.” Her thoughts lingered on the silk dress folded and wrapped carefully in the lovely blue and gold cloak that had hung idly in her room for several months.